If I had a better memory, tonight’s song wouldn’t have been such a revelation and I would have pieced together the string of We The People’s songs that I already like, (You Burn Me Up And Down, In The Past and Mirror Of Your Mind are just three examples! ); this band are responsible for many a happy psychedelic moment! We the People were a psych-garage rock band from Orlando, Florida who got together in late 1965 and became professionally active between 1966 and 1970. Although none of their singles charted nationally in the U.S., a number of them did reach the Top 10 of the local Orlando charts. The band is perhaps best remembered for their song Mirror of Your Mind which reached the Top 10 in a number of regional singles charts across the U.S. during 1966. 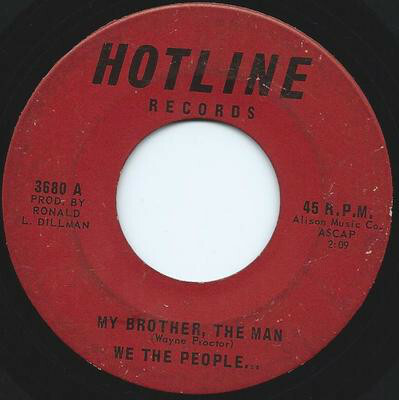 My Brother The Man was released by the band in 1966 on Hotline records and seems to be fetching hefty sums now if you can get your hands on a copy of the original! It’s one of my favourite We The People tracks with its rip-roaring psych guitar and melodic vocal ‘Whoops.’ I listen to a lot of garage music, I love a lot of psych music and We The People have always stood out for me! Treat yourself to a chunk of garage-rock and listen above. This entry was posted in garage, Garage punk, Garage Rock, Psych pop, Psych punk, Psych rock, Psychedelic and tagged 60's garage, Garage punk, Garage Rock, Hotline Records, Psychedelic rock. Bookmark the permalink.